In the show's grand tradition of family entertainment, with scary creatures, exciting chases, chaste romance (with a buxom companion), and more than a few choice laughs on the off chance anyone might start taking the show too seriously. 60 min. BBC. Director: Saul Metzstein. Cast: Matt Smith, Jenna Coleman, Richard E. Grant, Tom Ward, Neve McIntosh, Catrin Stewart, Dan Starkey, Ian McKellen. "What's wrong with silly?" asks the Doctor in Doctor Who's 2012 Christmas Special "The Snowmen." He's obviously speaking for screenwriter and showrunner Steven Moffat, and the answer is nothing, as long as it's executed in the witty, whimsical high spirits of Doctor Who. "The Snowmen" is in the show's grand tradition of family entertainment, with scary creatures, exciting chases, chaste romance (with a buxom companion), and more than a few choice laughs on the off chance anyone might start taking the show too seriously. Actually, Moffat does take the time-and-space-travelling Doctor seriously, and for all its silliness, "The Snowmen" proceeds from a serious premise (inspired by one-time Doctor Who story editor Douglas Adams): the Doctor is retired, and only a clear and present danger to planet Earth might rouse him from his doldrums. Obviously, Earth needs the Doctor, and his return to action amounts to something like his first adventure with new companion Clara Oswald (Jenna Louise-Coleman), the "Impossible Girl" who appeared in a different form in the series' previous episode, "Asylum of the Daleks." This time, Oswald is a barmaid at the Rose & Crown Pub in 1892 England, a time and place threatened by killer snowmen born of "memory snow." Flirty and fun, Clara quickly captures the Doctor's fancy, but to get him out of retirement, Clara will need some coaching from the Paternoster Gang (last seen in "A Good Man Goes to War"): gay-married interspecies couple Madame Vastra (Neve McIntosh in lizard-face) and Jenny Flint (Catrin Stewart), along with dim-bulb Sontaran sidekick Strax (Dan Starkey). One of the choice gags of this Victorian-era adventure is that investigators-of-the-weird Vastra and Flint are the true inspirations for Holmes and Watson. There's plenty of weird to go around, given that the sentient snowmen are a product of The Great Intelligence (voiced by Sir Ian McKellen), an alien force last seen in the 1967 second-Doctor story "The Abominable Snowmen." The Great Intelligence has not only harnessed local snow and ice but enlisted one Dr. Simeon (Richard E. Grant, elegantly chewing the scenery) to do its bidding. 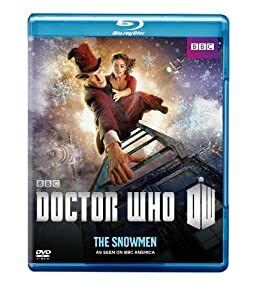 All in good fun, the nonsense piles snowman-high as an excuse for heroic antics but also charmingly sentimental character development, most notably that which succeeds in bonding the Doctor to the charismatic Clara. And in keeping with previous Christmas specials, this one sounds some lovely, lyrical notes of fantasy that literally put our heads in the clouds. "The Snowmen" introduces a new theme-tune arrangement, title sequence, and TARDIS interior set, but the episode's sweetest innovation is how the Doctor parks and accesses the TARDIS, with the kind of imagination we've come to love from the character and the show. BBC Home Video delivers what's certainly its best-yet A/V transfer for Doctor Who on Blu-ray. Though it's still in 1080i, "The Snowmen" features beautiful color, crisp detail, and a minimum of negligible digital artifacts (some shadow crush and aliasing). "The Snowmen" also steps it up with a breakthrough DTS-HD Master Audio 5.1 surround mix that delivers potent LFE and full-bodied music and effects that regularly and convincingly engage rear channels, with the dialogue--of paramount importance--never less than crystal-clear. Bonus features are slim, but all well-worth checking out. The bite-sized behind-the-scenes featurette "Clara’s White Christmas" (3:24, HD) contextualizes Clara a tad. We also get two brief but highly enjoyable bonus scenes: the prequel "Vastra Investigates" (2:44, HD) and "The Great Detective: Children in Need" (3:24, HD). The former features the Paternoster Gang, which is joined in the latter by the Doctor. All site content © 2000-2019 Peter Canavese. Page generated at 04/17/2019 04:35:01PM.